Molting This issue will not be examined extensively or scientifically. In fact own experiences will be reflected. 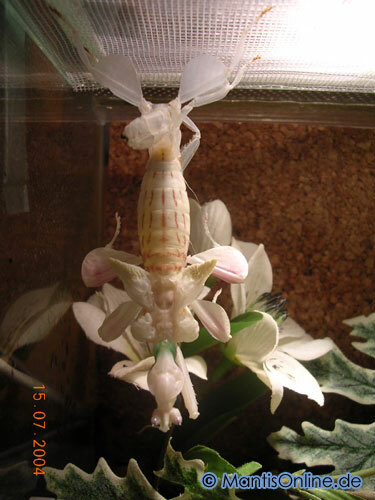 Mantids have a compact chitin-carapace, which can not grow. 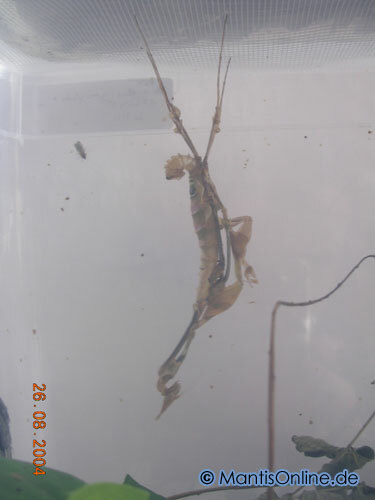 Thus mantids have to molt to grow. 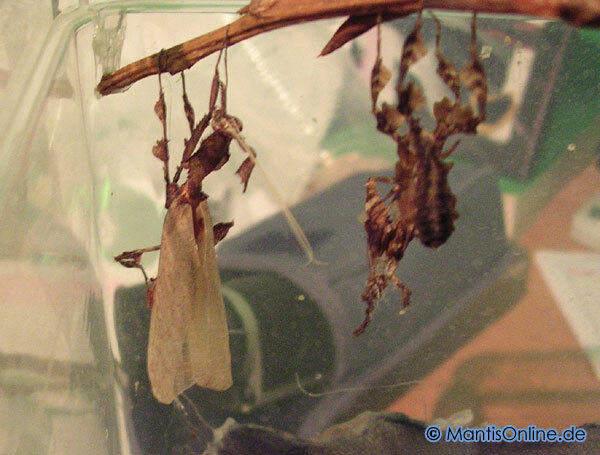 The first molting occurs at the hatching, the last before the sexual maturity. Between those several moltings are necessary, during which the larva grows bit by bit. The molting-procedure is always the same. Just the last molting to the imago differs. 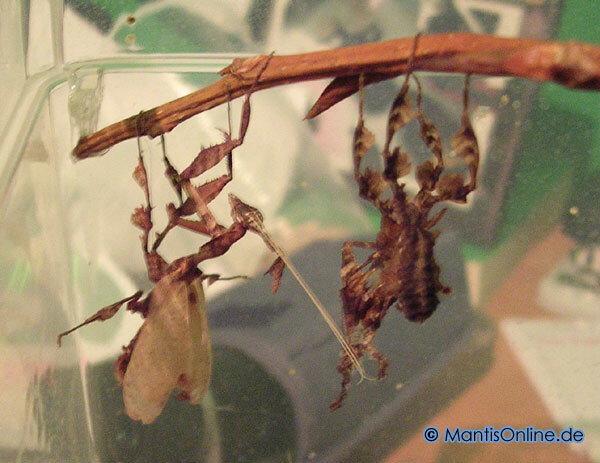 All mantids molt headfirst, exceptional some rare species like Eremiaphila sp. 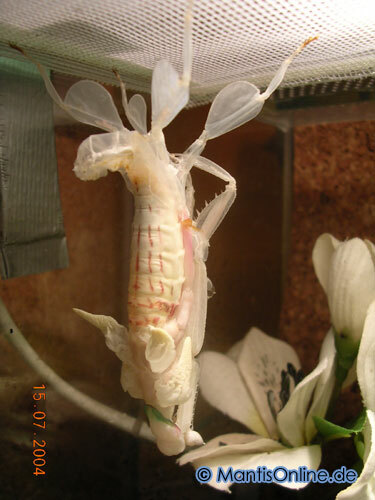 The molting is released by certain hormones. 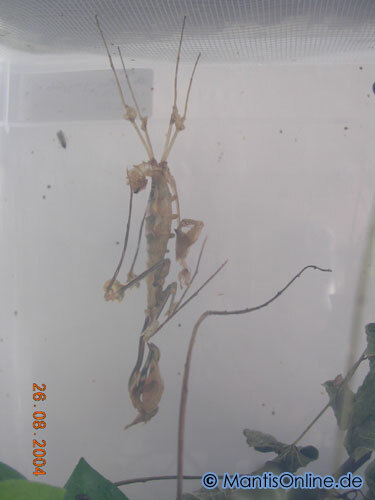 The mantid stops eating, a certain time (sometimes days) before the molting. 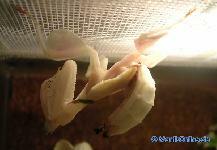 Shortly before, it searchs for a place to hang headfirst, like a perch or the top of the terrarium. Now the molting-process starts. By "pumping" with the abdome, air is pressed into the body and the old chitin-carapace is "burst open" at the back. This process can take several hours or even days. When the carapace is burst, the mantid slips out of it. At first the cervix and head, then the legs and the arms. At last the abdome follows, but not the whole, ca. 1/6 of the abdome remains in the old chin. This process needs half an hour, medial. But it should take not longer than 1- 2 hours. 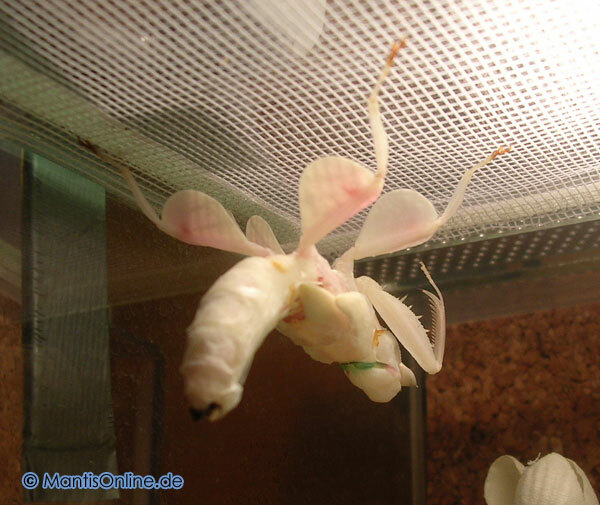 Now the pliant chitin-carapace has to harden, after hemolymph and air expended it to a maximum. Therefore the mantid remains with the end of the abdome in her old carapace, sometimes for hours. 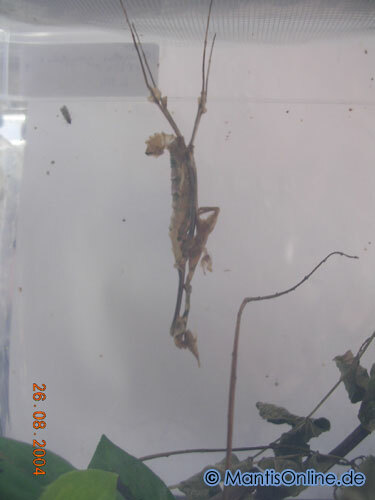 When the legs have hardened enough, the mantid pulls itselve out of the old skin and hardens at an adequate place. Sometimes this takes several days. Not till then, it starts to eat. 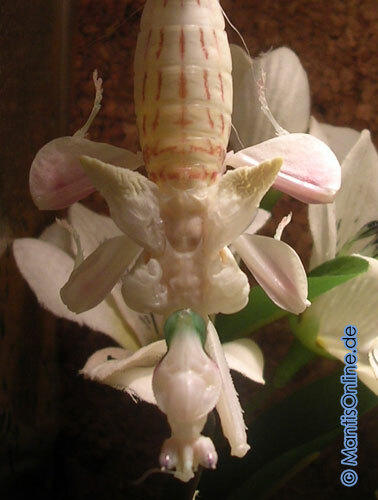 The imaginal-molting is the same up to the point, when the mantid gets complete out of the old skin. Then it searches for a vertical area. Such an area is necessary to unfold the wings by gravitation and by pumping hemolymph into them. This procedure can take several hours. During the hardening the carapace and the wings turn dark. Even potentially colour adjustments happen directly after the molting. areas where the mantids can hang headfirst are required, like gauze at the top of the terrarium or branches etc. 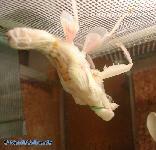 It is recommendable to rise the humidity before an expected molting, to avoid getting stuck. 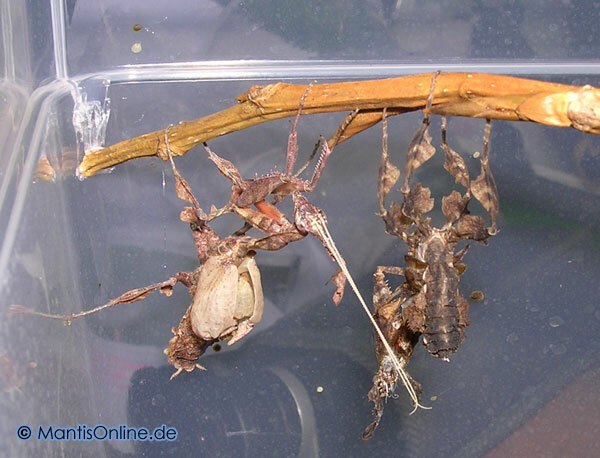 Note: Own experiences have shown, that the mantid "grows" between the moltings, that means the chitin-carapace can expend slightly.